Sightseeing including the Harbour Bridge, Opera House and Darling Harbour. Visit spectacular mountains. See kangaroos, koalas and much more. See a sheep shearing demonstration. Enjoy Spectacular, breathtaking scenery. Sydney Sightseeing including the Harbour Bridge, Opera House, and Darling Harbour. Plus a luncheon cruise on beautiful Sydney Harbour. Blue Mountains Visit these spectacular mountains. Featherdale Wildlife Park See kangaroos, koalas and much more at this fantastic Wildlife Park. Sheep Station See a sheep shearing demonstration. Canberra Enjoy a tour of Parliament House and more. Beechworth Stay in this historical township. Rutherglen Enjoy tastings of local wines with lunch. Melbourne Tour of the city sights. See the famous Penguin Parade on Phillip Island. 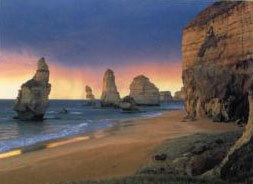 Great Ocean Road Enjoy spectacular, breathtaking scenery. * Package price per person, twin or double occupancy including airlines ticket from Los Angeles to Sydney and returning from Melbourne to Los Angeles departure May 5, 2006.